We have tentatively planned our route. We are going to leave London, England on June 3rd and take the ferry to France. From there we will cross Europe through Belgium, Germany, The Czech Republic, Austria, Hungary, Romania, and Bulgaria. We will go through Turkey and rest in Adana for a few days while Tom flies back to London to take care of some work-related business. Then we will go around the mediterranean sea through Syria and Jordan. We will take the ferry from Aqabah, Jordan to Egypt. We will visit the pyramids at Giza and then follow the Nile south to Aswan where we will board a boat that will take us to Wadi Halfa, Sudan. From Wadi Halfa we will continue to follow the Nile through the desert to Khartoum. We will then head to Ethiopia and turn south to Kenya. If the political situation in Western Kenya is calm enough when we arrive, we will head west to Uganda and Rwanda. If the situation in Rift Valley is unstable, we will probably ride straight south to Nairobi and then Tanzania. 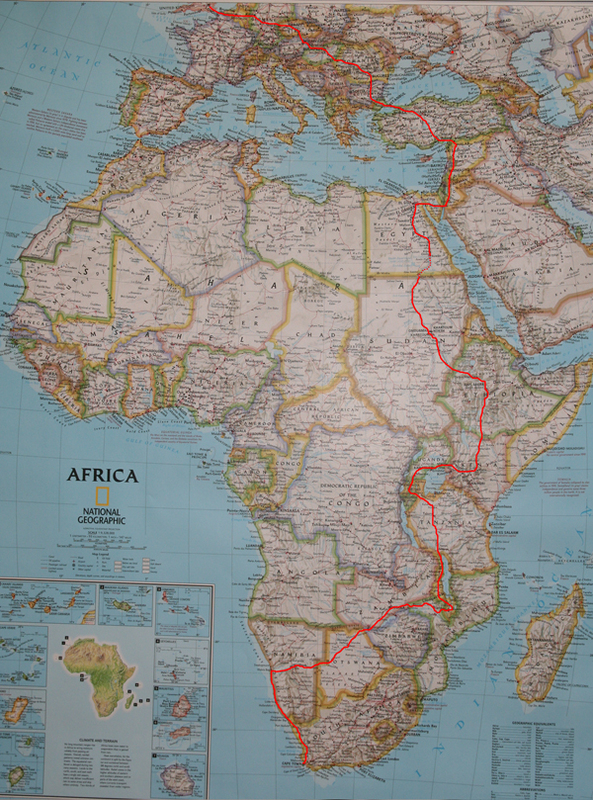 Either way we will ride through Tanzania to Malawi to visit the Dignitas project in Zomba. From Zomba we will head west through Mozambique to Zambia and Victoria Falls. From Victoria Falls we will continue westward through Botswana and Namibia all the way to the skeleton coast, at which point we will turn south for the last leg of the trip to Cape Town, South Africa.